Both franchises were finding themselves then, from a testy Christmas matchup in 2013 in Oakland to a chippy seven-game first-round series just four months later that was won by Los Angeles. Now, they each are more established — the Warriors a dynasty everyone else in the NBA is desperate to dethrone. 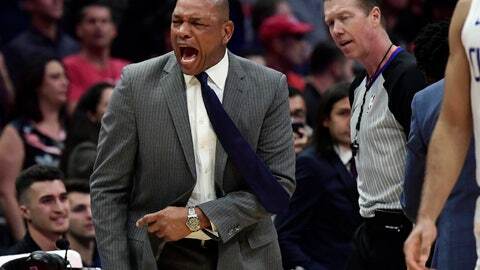 Doc Rivers has been a constant for the Clippers. Stephen Curry, Draymond Green and Klay Thompson for Golden State. “Totally different. They’re the young upstarts now, we’re the veteran team,” Warriors coach Steve Kerr said Friday. The teams are meeting in the first round again. Game 1 in the best-of-seven series is Saturday night at Oracle Arena, where the top-seeded Warriors have home court for the entire postseason — something they didn’t have as the Western Conference’s No. 2 seed a year ago on the way to a second straight title. During that 2014 playoff series, recordings of then-Clippers owner Donald Sterling surfaced in which he made racist comments, leading to him being banned by NBA Commissioner Adam Silver and forced by the league to sell the team. “I know the historical connotation, we talk about it and we want to chase it and understand how unprecedented it is what we’re trying to do,” Curry said. BEVERLEY’S INFLUENCE: Patrick Beverley missed four games down the stretch and Los Angeles lost all of those. The defensive specialist returned after missing three straight and played 21 minutes in a 143-137 overtime victory against the Jazz in the regular-season finale Wednesday night. The Clippers count heavily on their talented, versatile bench, too. Curry knows he can’t let Beverley get under his skin. HEALTHY STEPH: Curry wasn’t even healthy when the 2018 playoffs began. The two-time MVP returned from a left knee injury for Game 2 of the Western Conference semifinals, missing the entire first round as the Warriors eliminated the Spurs in five games. While he suffered a mild right foot sprain Tuesday at New Orleans, Curry was a full go in practice Friday with no issues. Kerr was committed to not sacrificing the health of his team down the stretch just to secure the No. 1 seed. Now, the Warriors should be well-rested for the playoff opener. COUSINS’ CHANCE: DeMarcus Cousins makes his playoff debut after a nine-year wait, and after returning from a devastating injury — he missed nearly a year recovering from surgery for a torn left Achilles tendon suffered last season with New Orleans. Everybody is eager to see Cousins on the big stage at last. That’s why he came to the Warriors as a free agent. Cousins made his season debut at the Clippers on Jan. 18 and he has become a significant contributor on both ends. “I just think he fits them better today than the first night that we played them,” Rivers said. DUBS ON D: The Warriors have made strides on defense in recent weeks, with the addition of 7-foot Andrew Bogut off the bench a big help even in limited minutes. “We’ve been in these types of series before, where it’s about the gamesmanship, understanding players’ tendencies,” Shaun Livingston said. ORACLE SHINES AGAIN: The Warriors said a ceremonial farewell to Oracle in their final regular-season home game April 7. Now, everybody hopes there are many more postseason games on Golden State’s home floor before the franchise moves across the bay to San Francisco and the new Chase Center later this year. Los Angeles realizes the challenges of winning in such an imposing venue. “Probably my favorite place to play so far my rookie year, just because of the atmosphere,” Clippers rookie Landry Shamet said.